It is narrated that once Aurangzeb Alamgir went to the glorious Shrine of the King of India Khawaja Ghareeb Nawaz. Within the boundary, a blind beggar was crying out, Ya Khawaja Ghareeb Nawaz! Restore my sight. He asked this beggar, Baba! How long has it been since asking for the vision? He said that it has been ages but my wish is unfulfilled. He said that I shall return in a short time after paying a visit to the Holy Shrine if your eyes gain vision very well, otherwise I will have you killed. After saying this the King called for the guards to keep an eye on the beggar, and King went inside to pay his respect. On the other hand, the beggar started lamenting and kept requesting while weeping, "Ya Khawaja! First, the deal was of eyes only but now it involves life if you do not show mercy I will be killed." When the King returned after paying his respect, His eyes had acquired the vision. The King smiled and said that until now you were asking without devoting heart and concentration, and now because of fear of life you asked from your heart, hence your wish was fulfilled. 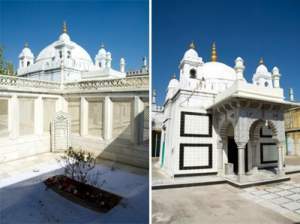 Hazrat Badshah Aurangzeb Aalamgir's Miracles in Darbar King of India Khwaja Gharib Nawaz Rehmatullah Aliah | Karamat Aulia Allah.